Author, speaker and filmmaker Roberta Moore talked with Dr. Heidi Horsley at the 2015 Association for Death Education and Counseling conference about grief, loss and near death experiences. 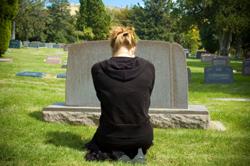 Having a near-death experience can change how people deal with grief and loss. For Moore, she had a near death experience at 13 years old, which led to a spontaneous out of body experience. In her 30s, she had an “experience of the light,” which she recalls as wonderful. Dr. Horsley relates, having had her own experience of the light after being in a head-on collision. She passed out, went into the light and remembers not wanting to come back. Moore notes that many who have had near death experiences don’t recall the pain or agony (should that happen). Instead, they remember leaving their body and being at peace. It’s a euphoric state. Dr. Horsley points out that many who have lost a loved one fear that they were suffering and in pain, so sharing near death experiences can give them great comfort. Moore says there are so many positive reports about near death experiences, that it can be tough to argue with them. “Their consciousness is separated from their body, and they feel whole in that consciousness,” she says. Her documentary is on training medical professionals about near death experiences, but also resonates with the general public.